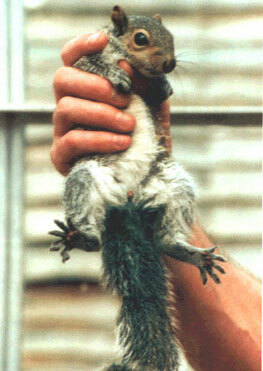 To catch a mobile squirrel simply wear stout gloves and put a cloth, blanket or coat over it and scoop it up. Put it straight into a suitable container: cat travel box or similar to prevent injury or escape. Squirrels give a chattering noise as a warning, but most are more frightened of you than you are of them. Be wary of sharp claws as well as teeth. An adult will bite out of fear or if stressed in some way - and it will hurt! Be careful. Youngsters less than about 12 weeks old will present no threat at all! Do not try to catch in a net. The best way to hold a squirrel is by the scruff of the neck, like a kitten or a puppy, and to support its bottom with your other hand. Unlike a kitten or puppy the squirrel will not be still; expect it to wriggle. You can also hold a squirrel by having his back in the palm of your hand, your thumb and forefinger gently but firmly round his neck to restrain his head. The front legs are held between the middle and forefinger with the other two gently round the abdomen. In this way the whole body takes the weight and the squirrel is quite immobile. Again, he will not like it! Once the squirrel is in a strong box, do not attempt to hold or pet him. He may escape or cause injury.